My edition: Paperback (uncorrected proof), to be published on 29 October 2013 by Harper Collins, 368 pages. Description: Elinor Dashwood, an architecture student, values patience and reliability. Her impulsive sister, Marianne, takes after their mother, Belle, and is fiery and creative, filling the house with her dramas and guitar playing while dreaming of going to art school. But when their father, Henry Dashwood, dies suddenly, his whole family finds itself forced out of Norland Park, their beloved home for twenty years. Without the comfort of status, they discover that their values are severely put to the test. Can Elinor remain stoic and restrained knowing that the man she really likes has already been ensnared by another girl? Will Marianne's faith in a one-and-only lifetime love be shaken by meeting the hottest boy in the county, John Willoughby? And in a world where social media and its opinions are the controlling forces at play, can love ever triumph over conventions and disapproval? Jane Austen's classic novel Sense & Sensibility has been adapted for a modern audience by bestselling author Joanna Trollope. The story centers on the Dashwood girls - Elinor, Marianne and Margaret - and their mother Belle. When the father of the family dies his son from a previous marriage inherits their Norland house and his wife in a not so subtle way forces the Dashwood women out of their home. As Belle doesn't work and all girls are still in school, money is tight and there is no other option for them than to take up the kind offer from a distant relative to move into a small cottage on his land in Devonshire. What follows is mainly the social struggle of the Dashwoods in their new surrounding and the romantic struggle of Elinor and Edward, Fanny's younger brother, and Marianne, who throws her heart and soul into a relationship with Wills. I will start my review with an honest but unpopular opinion: I am not a fan of Jane Austen's novels. I always find her female characters highly dramatic and the storylines dull at best. So when I came across the news of the Austen Project I wasn't instantly excited by the thought of more Jane Austen related releases but I was highly intrigued by the fact that the authors involved were going to modernise the works by placing the characters in a contemporary setting. I thought that updating the stories and giving the characters some much-needed modern perspective would be what could make me finally appreciate these literary classics, but I was wrong. While I did mostly enjoy the story of the Dashwood girls in this version I actually had a different problem with the reimagining of Austen's work. Despite the mention of iPods and computers the story felt dated as the characters spoke in an old-fashioned way and acted as if the old hierarchy was still very much alive. While I realise that Trollope tried to convey that amongst the wealthy families the importance of coming from and marrying into money remains as persistent as ever, this didn't come across well and at times it felt that the only updates the story had undergone were the frequent mentions of the earphones Margaret seemed inseparable from and the National Express coach Elinor used to travel between her house and London. I believe the novel would've benefitted from an update in the social progression as well, to make it more believable that the story was unfolding in the 21st century. Having said that, the writing is beautiful and lush and very reminiscent of an Austen novel so I am positive that the fans of the original stories will be very pleased with and excited by the modern retelling of the classic tale. And I do appreciate the underlying story more than I did before picking this up and it's made me keen to try one of Jane Austen's other works again in the not too distant future (mission accomplished for the clever brains behind the Austen project!). 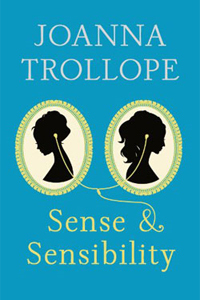 Joanna Trollope's Sense & Sensibility is the first release in the Austen Project and will be followed by Val McDermid's reimagining of Northanger Abbey in Spring 2014 and Curtis Sittenfeld's reworking of Pride & Prejudice in Autumn 2014. You can pre-order your copy of Sense & Sensibility from Amazon.co.uk, Amazon.com, Waterstones or your own preferred retailer. Many thanks to Lovereading for a copy of the novel in exchange for an honest review.